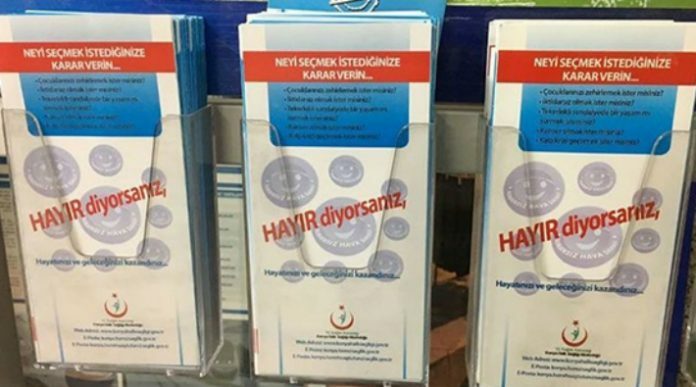 Some banners and brochures put out by the Konya Public Healthcare Directorate as part of the Health Ministry’s efforts to discourage people from smoking have been removed for fear that they may promote a “no” vote in a public referendum to be held in April. Turkey will hold a referendum on April 16 on a constitutional reform package which among other things introduces an executive presidency in the country. The banners and brochures, which say “No to smoking” and “If you say ‘no,’ you have gained your future,” have been removed from various locations in Konya. Ruling Justice and Development Party (AK Party) Konya deputy Abdullah Ağralı told media outlets that the banners and brochures have been removed to prevent a misunderstanding. This article originally appeared in Turkish Minute on Feb. 14.